The essence of urban lifestyle has finally come to Kota Kinabalu city! Live, Play, Thrive, Rest & Rejuvenate – all under one roof, one destination. Experience the whole new all-rounded urban lifestyle @ Riverson, The Lifestyle Hub. A destination that will awaken your senses the moment you arrive at its doorstep. Being all that means being at central too! Riverson is strategically located along the coastal highway of Kota Kinabalu, close to the heart of the city, just 10 minutes away from Kota Kinabalu International Airport, within the Central Business District and enjoys the marvellous seaside views of Sabah’s famed golden sunsets and the soothing blue waters of the bay beyond the beautiful Tunku Abdul Rahman Islands. 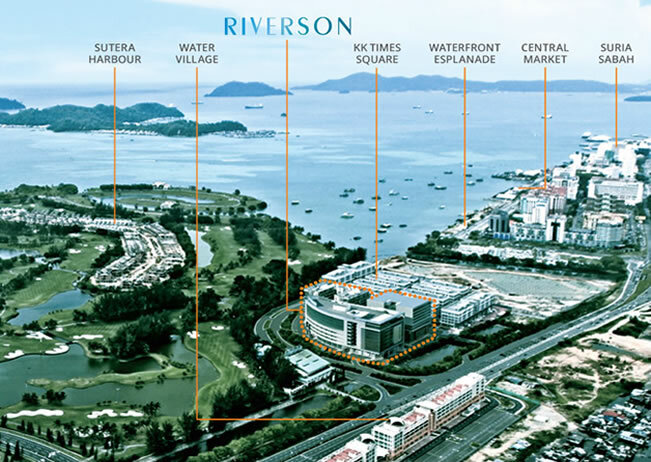 Riverson’s development is poised in-line with its neighbouring notable landmarks – the Sutera Harbour Golf & Country Club, KK Times Square I & II, the upcoming transport-interchange station, Wawasan Plaza, Harbour City, and the new Ming Garden Hotel – together they will form the new KK Southern City Hub.